I wanted soft colors in Brody's baby blue boy nursery and planned to use both new and old pieces. I chose the simple Jenny Lind Crib for it's timeless look and inexpensive price tag. I owned the white swivel chair, ottoman, dresser and mirror already and knew I would be able to utilize those in his room. I had plans to keep the room mostly gender neutral with just a few pops of blue. I love the way the room turned out with a bit of modern, rustic, traditional and a touch of antique. I found the blue zebra rug from Jonathan Adler and knew I wanted that to be the main focal point. I would have to say that my style is traditional with a love for antiques and a touch of modern. 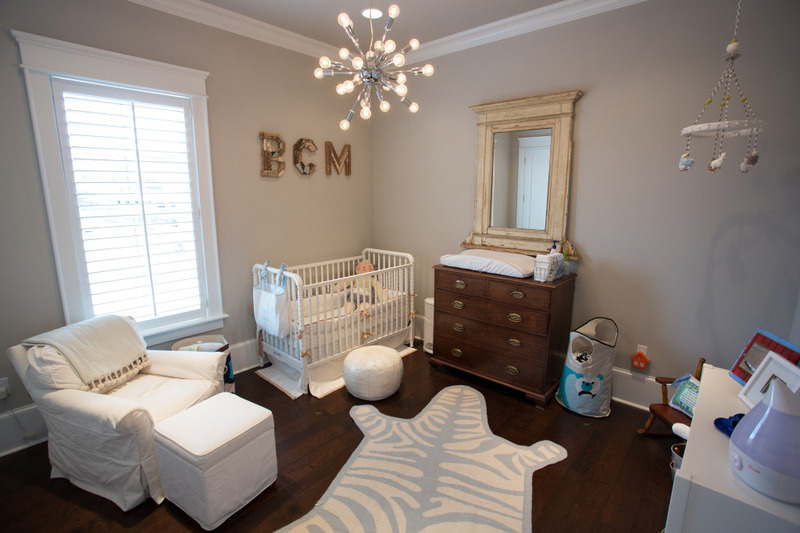 Find your statement piece or the one item you want to build your nursery around first. I think that helps give you the vision for the rest of the room. What a fabulous room. I love how the lighting and a little JA takes the nursery to a whole new level! Thanks so much for sharing Annie. Gorgeous! Love that sputnik light and all the small details. Thank you for sharing Annie!